Chikungunya is generally spread through bites from Aedes aegypti mosquitoes, but the chikungunya virus strains in the 2005-2006 Reunion Island outbreak contained a mutation that facilitated transmission by Aedes albopictus (Tiger mosquito). Enhanced transmission of chikungunya virus by Aedes albopictus could mean an increased risk for chikungunya outbreaks in other areas where the Asian tiger mosquito is present. A recent epidemic in Italy was likely perpetuated by Aedes albopictus. 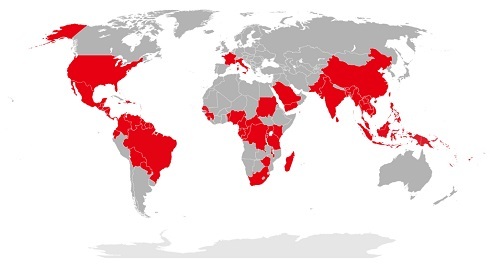 Currently, chikungunya fever has been identified in more than 50 countries (see figure 1). Chikungunya likely originated in Africa (see also section History of Chikungunya), where the virus is spread via a sylvatic cycle in which the virus largely resides in other primates in between human outbreaks. In 1952, the first outbreak of chikungunya was reported in the Makonde Plateau. The first significant urban outbreaks of chikungunya were reported in the early 1960s in Bangkok and from 1963 through 1973 in India. The chikungunya virus was detected mainly in the Indian cities Calcutta, Maharashtra and Yellore. Minor outbreaks periodically occurred over the next 30 years, but no major outbreaks were recorded. In 1969, chikungunya was detected in Sri Lanka and in 1975 the disease was reported in Vietnam and Myanmar. Another outbreak was reported in Indonesia in 1982. In 2004, Kenya experienced two major outbreaks of chikungunya. This outbreak started a four year period in which the virus spread throughout numerous islands of the Indian Ocean, India and parts of Southeast Asia. The first outbreak in Lamu, Kenya resulted in an estimated 13,500 cases, which represents more than 70% of the population of the island. The second outbreak occurred in the city of Mombasa a few months after the first cases in Lamu. By January 2005, an outbreak of chikungunya was detected in the Comoros. Over the next several months, the outbreak on the main island led to around 225,000 infections with chikungunya. Entomological investigations detected that Aedes aegypti mosquitoes were carriers of the chikungunya virus. The largest outbreak of chikungunya ever recorded at the time occurred on the island of Réunion in the western rim of the Indian Ocean from late March 2005 to February 2006. At its height, the incidence peaked at about 25,000 cases per week or 3500 daily in early 2006. By mid-December, when southern hemisphere summer temperatures are favorable for the mosquito vector, the incidence began to rise dramatically into the first two months of 2006. Although confirmed cases were much lower, some estimates based on extrapolations from the number detected by sentinel physicians suggested that as many as 110,000 of Réunion's population of 800,000 people may have been infected. Twelve cases of meningoencephalitis cases were confirmed to be associated with chikungunya infection. Other countries in the southwest Indian Ocean reported cases as well, including Mauritius and the Seychelles, and in Madagascar, the Comoros, and Mayotte. 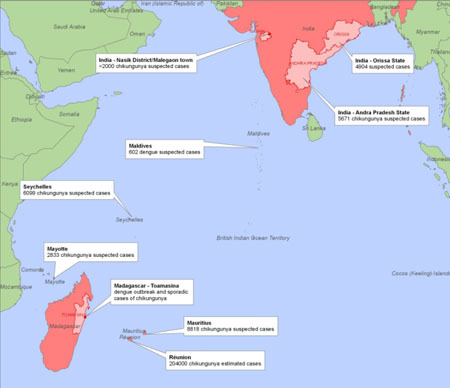 Other outbreaks of chikungunya fever subsequently occurred in other Indian Ocean countries, including Gabon, Madagascar, the Maldives, Mauritius, Mayotte, and the Seychelles (see figure 2). The epidemic also spread to India, where it is estimated that more than 1.5 million people were infected between February and October 2006. During this period, the WHO Regional Office for South-East Asia has reported 151 districts in 8 states/provinces of India affected by chikungunya fever. The affected states are Andhra Pradesh, Andaman and Nicobar Islands, Tamil Nadu, Karnataka, Maharashtra, Gujarat, Madhya Pradesh, Kerala and Delhi. The persistence number of infections in India is probably attributable to a large amount of immunologically naive people, who help sustain viral transmission. Several other countries in South-East Asia were also affected. The primary mosquito responsible for the transmission of chikungunya virus was Aedes aegypti. However, these mosquitoes were present in only limited numbers on the island of La Reunion due to massive dichlorodiphenyltrichloroethane usage. The Aedes albopictus mosquito was present and this resulted in an ecological pressure. Studies revealed that the chikungunya virus in La Reunion had a single point mutation in the E1 glycoprotein that increased infectivity in Aedes albopictus. There was a replacement of alanine at position 226 with valine (E1-A226V). Within a year, the mutated virus was present in La Reunion Island, and Aedes albopictus apparently vectored the large epidemic infecting one third of the Island’s population. The E1-A226V mutation also enabled an increase in infectivity of Aedes albopictus when compared to its infectivity of Aedes aegypti. Aedes albopictus has become the new preferred and more lethal vector for chikungunya virus. In 2007 the virus caused the first autochthonous epidemic outbreak in the north-east of Italy, with more than 200 human infections. Since 2008, infections were also reported from Singapore, Malaysia, Thailand and Australia. By the end of September 2009, there were more than 42,000 cases during the previous year in 50 provinces in the south of Thailand, including the popular tourist destination of Phuket. About 14 years had lapsed since the last appearance of the disease. Outbreaks in the Pacific Islands began in New Caledonia in 2011 and have since occurred in a number of Pacific countries. An outbreak occurred in Cambodia with at least 1500 confirmed cases. Provinces for which affection was confirmed were: Preah Vihear, Battambang, Kampong Thom, Kampong Chhnang, Kandal, Kampong Speu and Takeo. In December 2013, it was confirmed that chikungunya was being locally transmitted in the Americas for the first time in the French Caribbean dependency of St. Martin, with 66 confirmed cases and suspected cases of around 181. It is the first time in the Americas that the disease has spread to humans from a population of infected mosquitoes. By mid-January 2014, a number of cases had been confirmed in five countries: St. Martin, St. Barthelemy, Martinique, Guadeloupe, and the British Virgin Islands. At the start of April, at least ten nations had reported cases. By the start of May, there were more than 4,100 probable cases, and 31,000 suspected cases spanning 14 countries, including French Guiana, the only non-island nation with at least one reported case. On May 1, the Caribbean Public Health Agency declared a Caribbean-wide epidemic of the virus. On June 2014 six cases of the virus were confirmed in Brazil, two in the city of Campinas in the state of São Paulo. The six cases are Brazilian army soldiers who had recently returned from Haiti. The information was officially released by Campinas municipality, which considers that it has taken the appropriate actions. Brazil has reported by the end of 2014 a local transmission of a different strain (genotype) of chikungunya, that has never been documented in the Americas. This is an African genotype, but oddly fails to explain if its South African or West African. The new genotype (in the Americas) is more severe than the Asian genotype which is currently spreading through the Americas, and immunity to one genotype does not confer immunity to others. French Polynesia is among other regions experiencing ongoing outbreaks. On July 17, 2014, the first chikungunya case acquired in the United States was reported in Florida by the CDC in a man who had not recently traveled outside the United States. Shortly after another case was reported of a person in Florida being infected by the virus, not having traveled outside the U.S. These were the first two cases where the virus was passed directly by mosquitoes to persons on the U.S. mainland. Aside from the locally acquired infections, there were 484 other cases reported in the United States as of 5 August 2014. In September 2014, Venezuela stated that there could be between 65,000 and 117,000 Venezuelans infected with chikungunya. On 7 November 2014 Mexico reported an outbreak of chikungunya, acquired by local transmission, in southern state of Chiapas. Health authorities have reported a cumulative load of 39 laboratory-confirmed cases. By November 2014 the Pan American Health Organization reported about 800,000 suspected chikungunya cases in the Caribbean alone. As of January 2015 at least one major city (Medellín) in Colombia has issued sanitary alerts due to the expanding epidemic. By January 2015 the epidemic is considered to be in the initial expansion phase and it is expected by the Colombian National Health Institute (Instituto Nacional de Salud - INS) that the total number of cases will reach around 700,000 by the end of 2015 due to the in-country massive travel of tourists to and from regions where cases of the disease have been confirmed and the vector is indigenous. It is expected that the disease will become endemic and sustain itself, with a pattern of outbreaks similar to dengue fever, due to the fact that both vector and natural reservoirs are indigenous in large areas of the country. On 24 September 2015, the Ministry of Health and Social Protection of Colombia officially declared the country free of Chikungunya. There were 441,000 reported cases but the government stimated the infected to reach the 873,000.